The Studio Arts program offers the student a flexible and comprehensive course of study leading to a Bachelor of Fine Arts degree. Through exploration of historical and contemporary art practices, students develop technical and conceptual skills essential for success as professional artists or for graduate studies in a Master of Fine Arts program. Studio work, critical thinking and hands-on instruction by dedicated faculty are combined to foster development of artistic direction. The Studio Arts faculty works one-on-one with students sharing knowledge and challenging them to do their best work. The four-year curriculum begins with a foundation arts program. These courses provide students with fundamental concepts and hands-on experience needed for continued study for intermediate and advanced level studio. During the sophomore and junior year, students have the opportunity to explore areas of interest by selecting from seven media-specific courses. Each studio course focuses on the medium’s techniques, skills, history, materials, and processes. Students are encouraged to develop a broader understanding of the underlying concepts and ideas behind art making. In the junior year students will spend more time in the studio developing artistic skills needed for personal expression. Detailed information about the studio facilities will be posted soon. 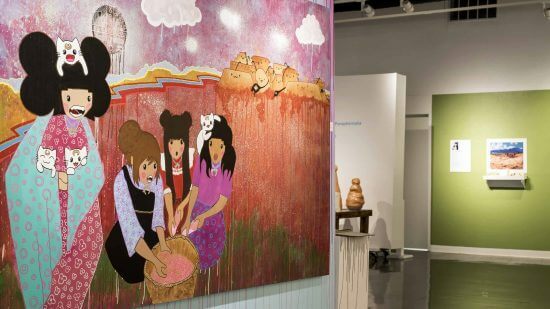 Our program is dedicated to educating exceptional students who will continue a 50-year legacy of influencing the Native art world. We prepare men and women to become self-employed studio artists, arts educators, and creative leaders in the arts. Many earn MFA degrees from prestigious graduate programs, and our award-winning alumni exhibit their work nationally and internationally.